Imagine downloading the hottest action movie in HD and watching it on your HDTV right after it’s completed. You’re sitting on your black leather couch as you enjoy the clarity, the crispness, and the sharpness of the moving images on your TV screen. 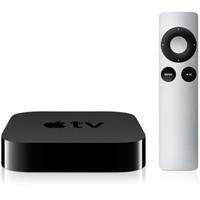 Everything happens in the comforts of your home and with just a few clicks on the Apple Remote. That’s the promise of the new Apple TV—an increased television viewing pleasure you’ve never had before. Apple TV, a small, compact entertainment powerhouse, takes home entertainment to a new height as it plays any content you love from iTunes, Netflix, or YouTube in up to 1080p. With Apple TV, you can even play your movie files from your Mac or view your photos from your previous trip on your HDTV. Experience all these and the other amazing things Apple TV has to offer as you grab one at MacMall, your number one Apple Superstore. MacMall is now taking pre-orders on this entertainment powerhouse for $99 only. For our affiliates, get the CJ link below and share everything about the new Apple TV with your loyal patrons.